Cooling, humidification, and pest control system using fine fog (Semi-Dry Fog®*1). Through automatic switching between two modes — cooling and humidification mode, and pest control mode — this system unifies once-separate functions in a single system that prevents high temperatures and dryness while eliminating disease-carrying pests. This approach reduces facility operating costs and reduces labor and costs formerly required for various discrete measures. Cooling and humidification mode reduces temperatures in-facility/greenhouse by up to 7°C via evaporative cooling without wetting crops or facility interior. Pest control mode creates a high-humidity growing environment to ensure that pesticides envelop and firmly cover crops, reducing pesticide usage volumes to one-third or less of volumes used by power sprayers. 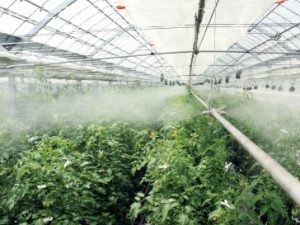 Producing Semi-Dry Fog®(*1) for cooling, humidification, and pest control. Reducing temperatures by up to 7°C with evaporative cooling of fog. Humidifying without wetting crops or greenhouse facilities. It doesn’t wet livestock bodies, feed and facility interiors. Spraying pesticides in Semi-Dry Fog® form during pest control operations, thus reducing pesticide usage volumes to one-third or less of volumes used by power sprayers. Suitable for greenhouse cooling in summer and humidification in winter. Ideal for mitigating heat stress and for pest control in livetock. Eliminating the need for human workers in pest control operations. We provide after-sales services following installation. For small-scale installations, easy D.I.Y.-style installation can be carried out by the customer. *1) We define Semi-Dry Fog® as a fog with a mean droplet diameter (mean fog droplet size) of 10–30 μm. This system uses fine droplets and does not include large droplets which can result in wetting of objects and surfaces, making it ideal for environments previously plagued with wetness-related problems caused by semi-fine fog cooling. “Dry mist“, despite its similar name, has no specified droplet diameter as part of its definition. Dry mist droplet sizes vary significantly by producer and product.